Marina Pez Vela is located on Costa Rica’s Central Pacific coast Quepos which is a small port town which is internationally known as a sport fishing hotspot. In this area the tranquil flat waters off the Central Pacific coastline offer an abundance of Pacific sailfish, marlin, tuna, mahi mahi, roosterfish, grouper, cubera, wahoo and more. This marina provides wet slips for rent as well as a variety of services and amenities and will welcome you to experience the lush beauty and warm hospitality of one of the world’s top boating destinations. Marina Pez Vela truly offers something for everyone. There are short or long term dockage, provisions, fuelling and charters for both cruise enthusiasts and fishing. Nearby the marina is Manuel Antonio which is a mecca for adventure and eco-tourism and also famed for its National Park. In this area you will also find bars, shops, hotels and restaurants which will suit every taste and budget. Marina Pez Vela offers international standard facilities. The dock system of this marina accommodates vessels up to 200 feet with a safe operating depth of 14 feet offering ease of access. Its dam protected basin provides safety and protection for your vessel and for you. In this marina you will get the amenities including portable water, electric, complementary Wi-Fi and free sanitary pump out capability at each slip. There are also other services which include 24 hour security and trash disposal. On a daily, monthly or yearly basis slips are available. There are public showers and restrooms which can be used by all of the boaters. Next to the Marina Pez Vela public parking is available. Administrative team of Marina Pez Vela will assist you in the clearing process into Costa Rica. This team will also help you to make your transition as convenient as possible. 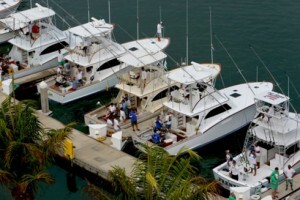 This marina will make a short trip on the central Pacific and will take your vessel to some of the best fishing grounds in the world and will enhance your enjoyment. The capable dock attendants are available from 6 am to 6 pm to assist you. When you will arrive the marina the dock attendants will welcome you and help with line handling, pump out, fueling, mooring, provisioning, dock transport service and more. And the front office staff will also assist you from 7am and 5pm.The entire team at Marina Pez Vela are trained to satisfy its clients, boaters and customers fully. There are also highly skilled and friendly security staff who will monitor the marina and uplands 24 hours a day, 7 days a week. As Marina Pez Vela is located directly next to the Coast Guard station of Quepos, any emergency services are readily available in the immediate vicinity. There are also a fire station, medical clinics with bilingual medical staff, the Red Cross and the regional hospital is only 2.5 miles away. For any non-emergency issues or special needs you many contact the Marina office between 7am and 5pm and the staff will always be ready to serve you.